The stamped steel Heat Reduction Hood features OE-style crumple zones and an e-coat primer for superior corrosion resistance. The side mesh inserts are removable to accommodate the installation of AEV’s Snorkel Kit. Please Note: The AEV Heat Reduction Hood has a dual windshield washer nozzle configuration. This is the current configuration found on all 2013+ JK Wranglers. If you have a 2007-12 JK Wrangler with a single windshield washer nozzle, installation of the Heat Reduction Hood will require switching to a dual windshield washer nozzle system. We offer an optional Dual Washer Nozzle Kit for an easy, professional looking installation. Does the Heat Reduction Hood really reduce temperatures? Absolutely! Of course we designed the hood to be aesthetically pleasing, but we also put a lot of fluid analysis into the location of the vents. There is a low-pressure area created at the front edge of the hood when the vehicle is in motion, and we placed the central vent of the hood in a position to take advantage of this. Since air likes to move from high pressure to low pressure areas, the placement of the center vent causes cooler outside air to be sucked through the radiator and up through the hood to fill in the low-pressure area. Besides engine performance, the AEV Hood can help significantly with the heat buildup in the under hood electronics, such as the TIPM (Total Integrated Power Module) which will shut the entire vehicle down if it gets too hot. Don’t be fooled by other hoods that are designed solely for aesthetics, they won’t help cool your vehicle (many have the vents placed in useless areas from a thermal dynamics perspective). My stock hood lifts up and flutters every time a truck passes me, does the AEV hood do this? No. In fact the very same aerodynamics that AEV uses to help cool the engine bay are contributing to your hood flutter as well. When a truck passes, pressure underneath the hood can build, to the point where it can be strong enough to overcome the weight of the hood and the resistance of the rubber latches, causing the hood to lift or flutter. The vents on the AEV Hood create an outlet for the pressure, allowing air to escape rather than creating hood lift. In addition, the AEV Hood is heavier than the stock hood, and its stamped contours provide additional strength, both of which help prevent hood lift and flutter. Will my engine get wet from the rain, what about corrosion? Yes, but that’s ok, it is designed to get wet. The under hood area is designated a “wet” compartment by Jeep and as such every component is water resistant (not waterproof, don’t try to drive through six feet of water). Corrosion from Magnesium Chloride will happen on aluminum components with or without the vents in the hood. Any vehicle that’s a few years old that has been driven in MgCl will develop a white powdery substance on the aluminum, but that’s normally not a problem. I live where it snows – will that be an issue? No. The AEV Hood has been specifically designed to keep snow build up out of critical areas. Is the AEV Hood steel, fiberglass or plastic? The AEV Hood is all steel. The durability and Class A surface finish of steel is unmatched. Hoods made from different materials such as fiberglass or plastic will not have the same appearance as the rest of the sheet metal on the vehicle (look at a JK’s plastic grille compared to the hood or fenders). Very often fiberglass will have ripples in it that will never go away regardless of how much body work is done. This is caused by small differences in the thickness of the material that change shape in the heat and cold. Fiberglass and plastic are great for racecars where weight is more important than appearance, and where they get replaced often. Compared to steel hoods, plastic ones are much cheaper to manufacture, but they won’t ever fit properly with the rest of the steel fenders and cowl. What does it take to paint an AEV Hood, is it more prone to rust than my factory hood? Painting the AEV Hood will be like any OE replacement hood, requiring a light scuffing followed by a quality sealer, basecoat, and clear coat. This should be applied by a professional body shop. AEV takes rust seriously. All of our hoods are delivered with an E-Coat finish, the same coating you would get on a factory replacement hood. E-coating is a multi-stage dipping process where every nook and cranny can be thoroughly coated. Will the AEV Hood work on a diesel? Yes, it will. 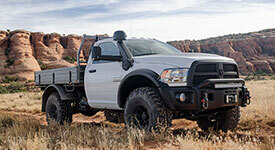 In fact, Chrysler found that the Diesel JK equipped with AEV’s Heat Reduction Hood could tow a trailer up the Davis Dam Grade 5-7mph faster than with a stock hood. 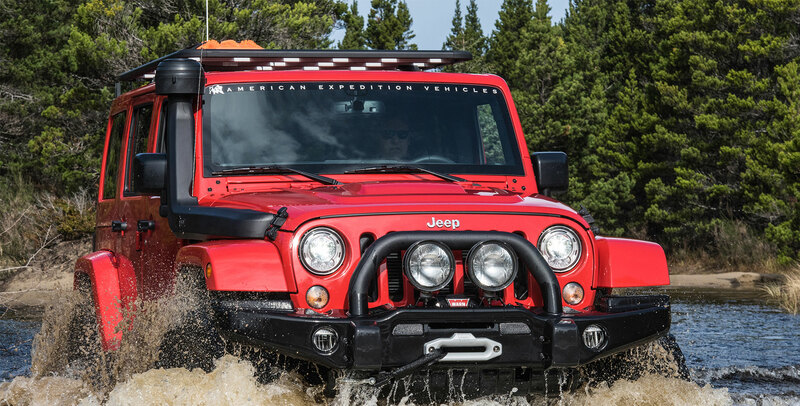 Is the AEV hood necessary with an AEV HEMI Conversion? No, but it’s certainly a good idea, particularly in areas of the country where engine temperatures may be an issue. Will the AEV Hood fit with my supercharger? It depends on the supercharger. Check with the manufacturer to be sure, most have intimate knowledge of the AEV hood with their kit. After the paint work is completed, it will take 30-45 minutes to install the Hood on the vehicle and adjust the fit. Where is the AEV Hood manufactured? The AEV Hood is proudly manufactured in Detroit, MI.